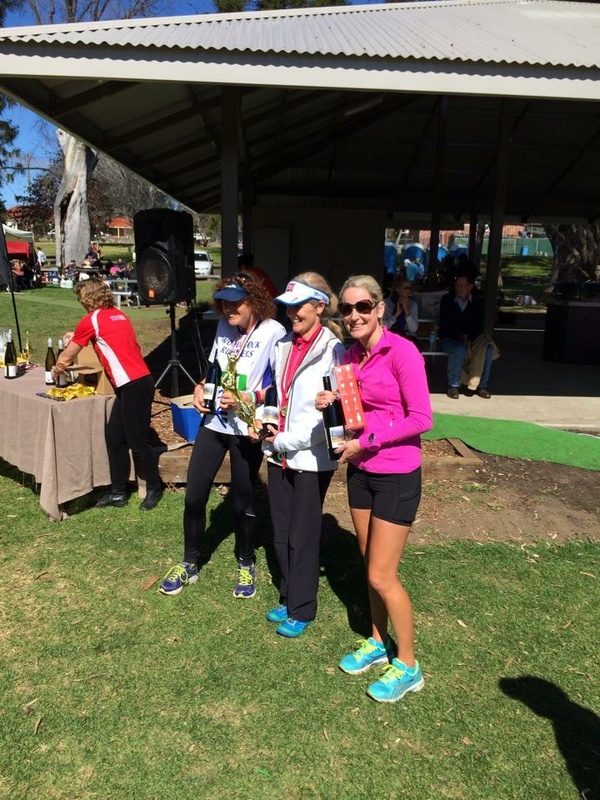 Yesterday was the 14th edition of the Mudgee Marathon, and my 10th for 2014. It was a lot warmer than last year, 13 degrees at the start. Quite Pleasant for Mudgee. The race started at 7am, and the half and full marathon started at the same time I had no idea who was running what, and a lot of fast people took off in front of me. After about 2km, the girl running next to me asked if there was anywhere to leave our jumpers, and I replied that the previous year, we left them at the first water station. We started to chat, and it turned out she was from Vancouver, Canada. I mentioned I had ran the Vancouver marathon in April, and we talked about running around Stanley Park. Before I knew it, we were at the 8km mark, and the half marathoners were all turning to run back the way we came. All of a sudden, it was a bit lonely out there. Thee race marshal at the half marathon turnaround said that I was the third female marathoner to pass… So It was nice to know how I was doing. I could see the second-placed female ahead. I had a gel, and passed her in the next kilometre. I was coming second. The road was long. Way up ahead in the distance, I could just make out a male runner, in black. He was a long way ahead. I began the climb uphill, that goes for about 7 kilometres. At about the 15km mark, I thought I could see the top of the hill. As I crested it, I got to run downhill for a few seconds, only to come around a corner and see another hill. You’ve got to be kidding me. Up I went again. Soon, I came to the water station that marks the start of the out-and-back section of the course. Steep downhill for about 600m, and then a bit of flat, on a dirt road, until the turnaround. As I began my descent, I passed the race leader, on his way back up. A few minutes later, I passed the lead female, also on her way back up. Not too far behind her was the man in black, and then me. I turned and started to make my way back up. 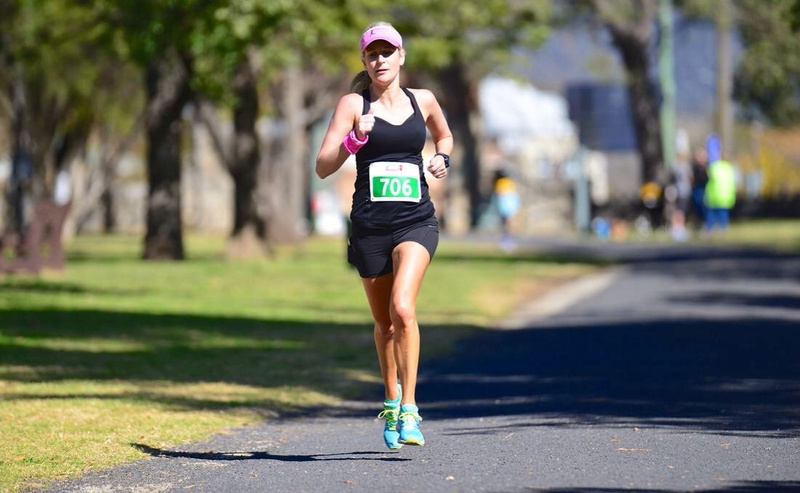 Runners who were on the way down called out to me that she was only a few hundred metres ahead…. ‘Only’ was not the word I would have used… It would have been at least 500m, which is close to a 3 minute lead. At our current pace, that would blow out to a 6 or 7 minute lead by the finish line. A convincing win. The next 10 km were pretty uneventful. I passed no one, no one passed me. Near the 30km mark, the man in black in front of me came into view. Now, I’ve had to wear glasses since preschool, and I don’t wear them to run in, so for somebody to be in my sight, means that they are reasonably close. Over the next couple of k’s, I concentrated on closing the gap. I had gel. #3. Eventually I passed him. Up ahead, I thought I saw the leading female, in White. It was just a fence post. I turned left, off the main road, and then left again. All of a sudden, I could see a little figure in White, up ahead. I turned right. Another hill. I tried to pretend that it didn’t exist. After hilly races in the Blue Mountains earlier this year, it really was nothing. I passed through the next water station, at Lowe Winery. “That’s your target, chase it!” The volunteers said to me. But she still seemed so far away. I concentrated on closing the gap. A couple of k’s later, I was close. There was 7km to go. I wondered if I should surge and pass now, or hold off for a few more km. What if she doesn’t realize I’m there, and she has only relaxed her pace because she thinks she has a massive lead? She might have heaps left in the tank, and run off ahead again if I try to make a move, never to be caught again. If I waited until a km or two to go, I was more confident that I would be able to hold her off if she responded. Before I knew it, I was beside her. I kept going, up the small hill in front of us. With only about 6 km to go, I had another gel. I don’t usually have a gel that late in a marathon, but I didn’t want to bonk now. A couple of k’s later, I passed another man as he took a walk break up another hill. This entire race feels like it is uphill. I reached a T intersection. There was no signage. I wasn’t sure whether to go left or right. I chose left, because I thought that road led back to town, and there were only a few k’s left now. Luckily, it was the right choice. My Poptop of Gatorade was empty. I had been filling it up from cups along the way. I tossed it out… There would be nowhere to fill it up now. 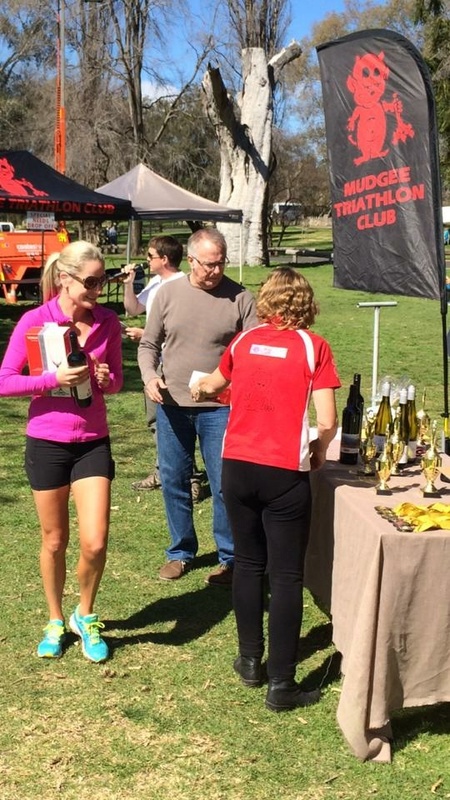 It was getting pretty warm for a winter Mudgee day…. Up to about 18 degrees. Another runner who had finished his event was out on course, and offered a bottle of Gatorade. I gladly accepted some. As I entered the park, the marshalls yelled that I was first female, and third overall. Awesome! 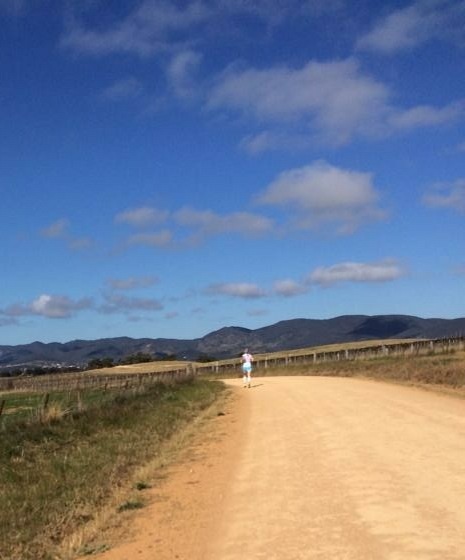 I ran past my friend Cade, who lives in Mudgee and had come down to see me finish. I crossed the line, first! Stoked. My second win, and first for the marathon distance! Happy with my time too, 3:25:48. On a difficult, hilly, off-road course, I couldn’t ask for much more. Nearly 20 minutes faster than my time on the same course last year too. I stuck around for the presentation before beginning the 4 hour drive back to Newcastle. 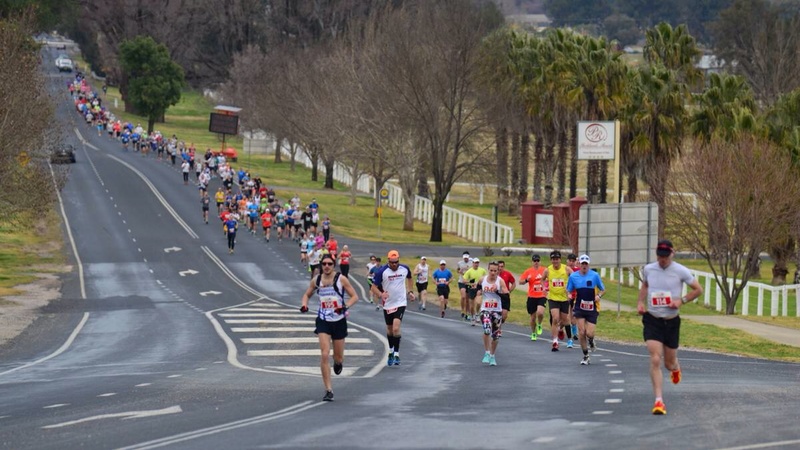 Outfit of choice – Asics Skyspeed shoes, New Balance socks, Lululemon short and Free to Be top, Zensah arm warmers and Night Strider sun visor. Weather – Fine and clear. Well done and congratulations Kirby. Thanks for another thrilling marathon story. Your running exploits are accruing legendary status. Another fine effort. Please change the background on your blog as it makes it impossible to read – thx!